A newborn baby girl found abandoned in a park has been named after the dog whose walker found her. Jade, who has been named by hospital staff, was found in a bag wrapped in a towel at a community park in Stechford, Birmingham, on Thursday afternoon. The girl, who weighs about 6lbs (2.7kg), remains in hospital and should make a full recovery over the next two days, West Midlands Police said. 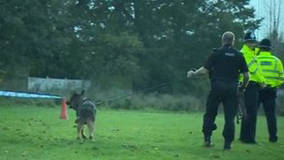 Roger Wilday, whose German shepherd dog found Jade, said he was proud of her. The baby was thought to be about 24 hours old when she was found at about 14:00 GMT on Thursday and believed to have been there for about 30 minutes before being discovered. 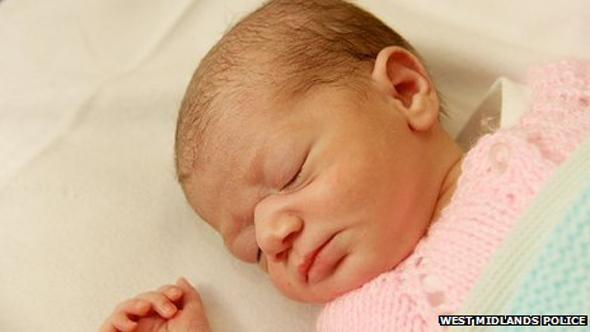 Police said baby Jade was now "alert, happy and contented". Mr Wilday said he had been walking Jade the dog when the animal was attracted to some bushes in the park off Stuarts Road. The baby was found inside a carrier bag from The Entertainer toy shop. He said he first thought they had found a bag of dumped kittens and was shocked to find a crying baby inside, wrapped in a blanket and naked from the waist up. "I was just coming back [out of the park] and Jade went to some bushes and she wouldn't come back to me... I went to look and saw a carrier bag in the bushes and it moved," he said. "I thought, 'what's that?' and heard a cry and so I looked in the bag and it was a baby in there." He said he thought his dog's superior hearing led to the find and said he was relieved the baby had only been there for a short time. After making the discovery, he contacted a friend who called the police. Mr Wilday was told by them to pick the baby up and he was then met by officers in the park. "If she had been there overnight, I think she might have died," he said. "I think my dog saved the baby's life. I'm very proud of her." He appealed to the mother to come forward and contact police and said he hoped to visit Jade in the coming days. "She's a beautiful baby... just come forward because she is missing out on these first few days," Mr Wilday said. Jade was admitted to Heartlands Hospital just before 15:00 GMT. Ch Insp Ian Green said: "Paediatricians have confirmed the baby was lucky to be found when she was, as even just a few more hours exposed to the elements could have had fatal consequences. "Thankfully, we now know she's safe and well - and our priority is very much on finding her mum to ensure her safety and to provide whatever support she needs." Police said the towel she was wrapped in, along with the carrier bag, had been "sent away for fast-track forensics" and it was hoped DNA samples taken from Jade would help identify her parents. Checks have been made with regional hospitals, medical centres and care homes. Ch Insp Green said Jade was "doing well" but "of course what she really needs is to be in her mother's arms". He added: "It is fantastic news that baby Jade is recovering well in hospital; I'm told she's very alert and a contented happy baby." Police urged the baby's mother to make contact.